Dr. Larry W. McDaniel Ed.D. Allie Winkle, Allen Jackson, MS. Laura Gaudet PHD discuss the common knee problem Patellar Tendinopathy. Patellar Tendinopathy is commonly known as "Jumper's Knee" is caused by the overuse of the Patellar Tendon. This injury frequently affects athletes involved in jumping sports which is included in a group of activities that are classified as high impact sports. High impact sports are a physical activity that places above normal force on joints, bones, tendons, and ligaments. These high impact sports include basketball, dance, volleyball, soccer, football, track and field (distance running, highjump and longjump), mountain climbing, figure skating, tennis and skiing. Other people who may suffer from Patellar Tendinopathy include military recruits. This group is training in activities that strain the knee which makes them more likely to develop Patellar Tendinopathy. The overall occurrence of Patellar Tendinopathy among sporting athletes has been estimated at 15% with a higher prevalence of about 50% in elite jumping athletes such as volleyball and basketball players. The key warning sign of "Jumper's Knee" is a shooting pain just below the Patella, commonly known as the kneecap, when walking, working out, or performing daily activities. The overuse of the Patellar Tendon represents approximately 15% of all soft-tissue injuries in athletes (Peers, 2005). When Patellar Tendon overuse occurs inflammation of the Patellar Tendon gradually become more painful. In a survey that was independent of any treatment strategies, one-third of the athletes with Patellar Tendinopathy were unable to practice or participate in their sport for six months (Peers, 2005). Tendon overload occurs when "forces of 3 to 8% strain are applied to the tendon which causes microtrauma", a small injury to connective tissue that may include micro-tearing of muscle fibres (Peers, 2005). The forces applied when landing to the knee joint, Patellar Tendon, and other knee tendons may be greater than nine times the participates body weight (Donohue, 2008). There are various ways to avoid knee pain which involve strengthening the muscles that surround the knee; the Gluteus Maximus, Quadriceps, and Hamstring muscles. By increasing the strength of the muscles of the knee joint the load placed on the knee joint will be reduced. This also includes the forces on the Patellar Tendon. In addition to participating in strengthening activities, a conditioning plan that integrates routine trunk and lower-limb stretching, plyometric training to increase endurance may assist in the reduction of excessive stress on the Patellar Tendon. Risk factors that contribute to the injury of the Patellar Tendon are inflexibility of the Quadriceps and Hamstring muscles, inappropriate overload of quantity and intensity of training, the hardness of the playing surface, and limited evidence of inherited biomechanical risk factors (Vulpiani, 2007). As stated previously Patellar Tendinopathy, the over usage of the Patellar Tendon occurs mainly in athletes that participate in jumping and high impact sports. Patellar Tendinopathy may occur when there are rapid acceleration and deceleration, jumping, or landing from a jump. The sports that are affected cause inflammation in the knee joint specifically in the Patellar Tendon. High impact sports involve both feet leaving the ground simultaneously and other quick movements. Track and field events such as running or sprinting, tennis, skiing, soccer, and football are high impact sports that place pressure on the knee joint and the Patellar Tendon. In company with these common sports among athletes, there is another sport that affects the Patellar Tendon greater in male athletes than in female athletes this sport is dancing. Males experience more repetitive jumps in dancing than females (Mattingly, 2005). Patellar Tendinopathy may occur in males between the ages of fourteen and sixteen who experience a sudden growth spurt which is characterized by the bones of the leg outgrowing the tendons and muscles of the leg. The unexpected athletes affected by Patellar Tendinopathy are military recruits during high impact training. The most common warning signs of knee inflammation are a pain, aching, and swelling generated in the location of the Patellar Tendon. These symptoms may be found on the lower side of the patella on the front of the knee, during walking, jumping, and exercising. Inflammation that occurs during Patellar Tendinopathy may be found in several areas. These areas include the top of the Patellar Tendon, the bottom of the kneecap, the bottom of the Patellar Tendon, and the top of the Tibia. The inflammation is caused by overuse of the joint without a sufficient amount of rest (Donohue, 2008). The stages of inflammation are classified according to symptoms using a scale from zero to five with five indicating the most pain. These stages may assist those suffering from Patellar Tendinopathy to determine the severity the injury and the amount of activity that can be endured Stage one is a minimal worry, pain only after activity all that is needed is rest. Stage two is a little worry, pain before and after activity rest may be needed. Stage one and two may respond well to a conservative intervention involving therapeutic exercise, ice, ultrasound, cross-friction massage, and rest (Klucinec, 2001). Stage three more worry, pain during activity and less able to perform at a satisfactory level. When in stage three prolonged level of rest, and a limited number of activity sessions are advised (Klucinec, 2001). Stage four increased worry, pain during activity, not able to perform at a satisfactory level. In stage four further treatments may be advised. Stage five very concerned, pain during daily activity. In stage five surgical treatments may be recommended. At Patellar Tendinopathy's worst, there will be a pain while sitting or at rest. Rehabilitation exercises are recommended to reduce knee pain caused by Patellar Tendinopathy. These exercises consist of strengthening, stretching, and plyometric training. Strengthening the Quadriceps, Hamstrings, and Gluteus Maximus muscles may assist in reducing knee pain and the damaging effects of Patellar Tendinopathy. As the muscles above increase in strength, the tendon experiences less stress (Kongsgaard, 2007). The tendon will be able to avoid being overused if the muscles around it have the strength to reduce the stress on the tendon. Stretching the muscles around the tendon will increase flexibility in the joint to improve range of motion and the ability of the joint to move smoothly through the motion. Stretching on a daily bases before and after workouts may reduce stiffness in the joints and remove lactic acid from the muscles. Plyometric training may improve muscle endurance. By improving the muscles' endurance these muscles will be able to endure increased stress for longer periods of time without resorting to a tendon for more support which may overload the tendon and cause injuries. Below are some tips on avoiding knee pain. Avoid repetitive jumping on a hard floor (Mattingly, 2005). Unavoidable risk factors that contribute to Patellar Tendinopathy are inflexibility of the Quadriceps and Hamstring muscles, strength of the Gluteus Maximus, Hamstring, and Quadriceps muscles, inappropriate overload of quantity and intensity of training, hardness of the playing surface, and limited evidence of inherited biomechanical risk factors (Vulpiani, 2007). Patellar Tendinopathy, commonly known as "Jumper's Knee" is the overuse of the Patellar Tendon. The over usage of the knee is frequently found in athletes that are involved in jumping sports. These sports include volleyball, basketball, dance, figure skating, and many more. Any high impact activities involving the lower body effect "Jumper's Knee". Some examples of high impact activities are sprinting, jumping jacks, and jumping rope. However, the wide range of patients affected by Patellar Tendinopathy is not only found in sports. The pain of Patellar Tendinopathy may affect fourteen to sixteen-year-old males going through a growth spurt. It also affects military recruits during basic training participating in high impact activities as part of their fitness preparation. Before symptoms occur relating to Patellar Tendinopathy, there are ways to avoid knee pain and injury. Knowing how to avoid knee pain may protect the patient from injury. 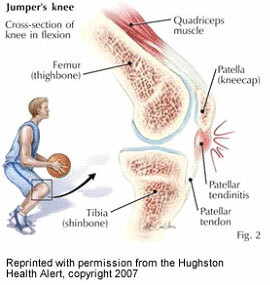 Common symptoms related to "Jumper's Knee" include pain, aching, and swelling on the lower side of the anterior surface of the Patella. Other symptoms include weakness and cramping of the knee joint. There are common home remedies to treat "Jumper's Knee" such as ice, rest, and anti-inflammatory medicine. Advil or Motrin may be used only in the early stages of injury If the injury symptoms are left untreated the result may be knee surgery. A patient returning to participation in physical activities should apply heat to the knee for 10 or 15 minutes before starting an activity. Following activity apply ice for 10 or 15 minutes (Dr. Donohue, 2008). Conservative treatments heal and keep Patellar Tendinopathy at bay for more than 90% of cases (Vulpiani, 2007). Awareness of the warning signs and stages may assist in the process of avoiding damage to the Patellar Tendon. Athletes, coaches, and athletic trainer's knowledge of the five stages warning signs, and risk factors may assist doctors in the process of diagnosing and treating the injury more effectively. The ability to diagnose the treatment as early as possible assists doctors in the process of returning patients to physical activities. Larry W. McDaniel Ed.D. is an Associate Professor of Exercise Science at Dakota State University Madison, SD. USA. Dr. McDaniel was a First Team All-American football player (USA Football), a Hall of Fame Athlete, and Hall of Fame Wrestling Coach. Allen Jackson, M. Ed. is an Assistant Professor of Physical Education and Health at Chadron State College in Chadron, Nebraska (USA) who is well known for his presentations and publications at international conferences focusing on Leadership, Curriculum, and Health. Laura Gaudet, Ph.D. is a Professor and Chair of the Department of Counselling, Psychology and Social Work at Chadron State College, Chadron NE. Allie Winkle Dakota State University is an outstanding student of Exercise Science.